I created this diagram for my own benefit, to help me clarify the focus for what I want to do with The Smart Work Company. It has been useful enough but it would be even better if it was somehow animated. The diagram looks deceivingly simple, when in reality what it aims to show is the collision of multiple complex systems, of differing degrees of complexity (connectivity, uncertainty of outcomes, and rates of change). I’m interested in getting to grips with the complex adaptive systems stuff that comes out of the Santa Fe Institute, but the language in some of the papers on complexity that I’ve had to plough through just annoys me. Call me an ignoramous if you like. Although complexity experts might disagree, this wee video explains one interpretation of what complexity is in an easy-to-understand way. Each element in the diagram at the start of this post is complex because of the people involved in designing and making the systems exist in the first place – through what they do together. 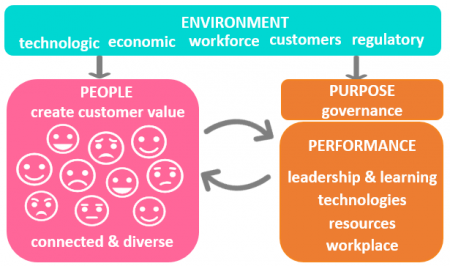 This includes all the elements in the Environment section, and all the elements in an organisation’s performance support system. There’s something else that I think has to add to complexity and that’s diversity in perceiving rates of change. If the elements in the environment are changing rapidly, some people will sense what’s happening before others who have more closed or fixed minds. The conclusion I come to on this is that there will typically be a lag between events in the external environment and the rate at which existing performance systems change. That’s why reflexive learning sewn into everything a business does, not as a Learning and Development add-on, is critical if organisations are to be able to adapt as rapidly as they need to. David James of Looop is on the money when he talks about in-the-flow, “learning at the point-of-need”. Tools like Looop give people the resources to be able to learn reflexively, as things unfold. But there’s a step before that. Businesses need to organise in ways that encourage informal social networks and collaboration across organisational boundaries. I wrote about that in more detail on my website, if you are interested.